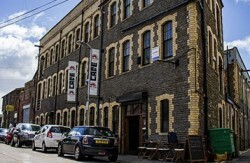 One of four spaces in Cardiff, Trade Street is spacious and light. Trade Street is a great location, only a 5 minute walk from the Cardiff Central Station and with parking available right outside. It includes meeting rooms, super-fast wifi and of course endless tea and coffee. Indycube Trade Street is open from 9 - 5:00pm Monday to Friday, with 24/7 access for full-time users of indycube.